D3DGear is a friendly tool designed to help games record their in-game progress – perfect to show off skills, records or to create tutorials. The application lets you perform a few settings. Users can set it to show frame per second (FPS) in one of the supported areas of the screen, as well as change the font color. D3DGear also includes screenshot functionality allowing you to save the captured screens as JPG, GIF, PNG or BMP files. Video recording function supports AVI and WMV as output formats, and users can change video resolution using one of the preset values. Moreover, the application offers custom keyboard shortcuts for most of its actions and provides the option to change default output folders. 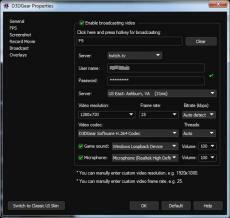 You can configure the program to broadcast videos and/or sound from your microphone as they’re being recorded to URLs of websites supporting this feature.